One of the things we were most excited about when we finally started traveling through the Andes region of South America was the prospect of getting quinoa right out of the farmers’ hands, being right where it is grown. During our annual visits to the U.S., we had witnessed how quinoa had gotten more and more popular there over the last few years, and it had become a regular item on our shopping list. In 2010, it was still a novelty to see quinoa on a menu – only available at Whole Foods or other specialized vegetarian or organic shops – two years later, nearly all of the major supermarkets were stocking quinoa and in 2013, it was hard to find a restaurant that didn’t have some kind of quinoa dish on the menu. In fact, the U.S. had imported 68 million pounds of quinoa in 2013 – compared to only 7.3 million pounds in 2007! Within six years, consumption had almost multiplied tenfold and the U.S. are currently the world’s number one importer of quinoa. The UN even declared 2013 as the ‘International Year of Quinoa‘! What had happened that this exotic vegetable (often thought of as a grain, but it is actually closer to spinach or beets than to grains), virtually unknown a decade ago, had become one of the most sought-after foods in such a short time? It is rare that a ‘new’ food is incorporated in a nation’s diet as smoothly as quinoa found its way into thousands of health-conscious people’s kitchens. When you look at the nutritional value of it though, it is easy to understand why quinoa is so popular: one portion covers nearly 30 per cent of the recommended daily protein intake (a portion of rice in comparison only covers 5 per cent) and it has nearly twice as much iron, magnesium, zinc, fiber and potassium as grains or rice. And it is not only super nutritious, but also delicious! A nutty taste, while the texture reminds of couscous, and it is easy to prepare. In addition, it is gluten-free and considering the growing amount of people who try to avoid gluten, this is the ideal ‘superfood’ for celiacs, for vegetarians and vegans. Are we hurting the people who grow quinoa? When demand really rose a few years ago, critical voices started to appear. They were claiming the growing export numbers caused such an increase in prices for quinoa that local farmers in the Andes region, where quinoa is grown, weren’t able to afford it anymore. By buying quinoa, people would hurt Bolivian farmers who had lost their most nutritious food due to the huge appetite for quinoa in the U.S. and other first-world countries, selling so much that there was barely anything left for their own needs. Knowing this, we were interested to travel in the regions where quinoa was grown – the altiplano of Bolivia, and Peru’s and Ecuador’s Andes regions, which are the world’s three biggest producers of quinoa. We wanted to see what the situation was really like. When we crossed into Bolivia from Chile, we quickly noticed that there was indeed barely any quinoa to find. We didn’t see quinoa on many restaurant menus, and had to really look for it in the markets. 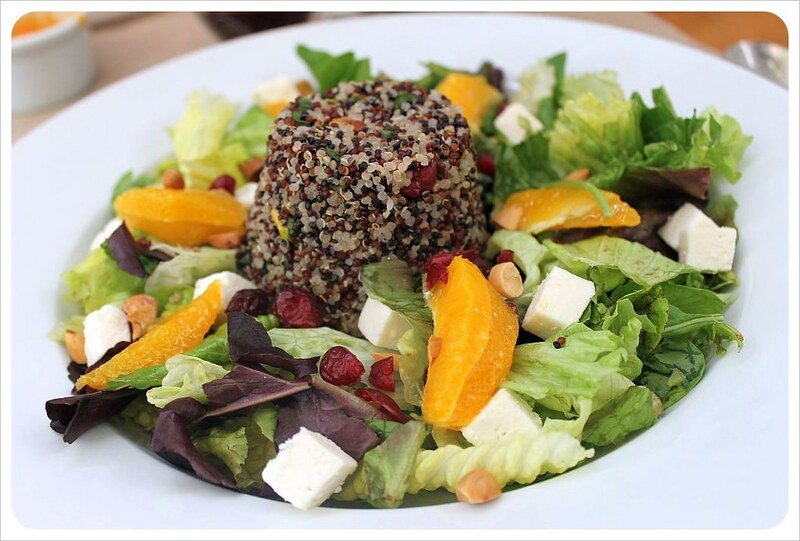 Coming from Chile, a rather developed country, we had come across quinoa in several places, even an entire restaurant dedicated to it – Quinoa in Santiago. Too expensive for the locals? When we didn’t really come across much quinoa in Peru either, we figured that the rumors must be true: quinoa had become too expensive for the locals to afford it. After all, the price per kilo on the world market had tripled between 2006 and 2011 and was still rising! Whenever we did see quinoa in a supermarket, it was around a whopping $4.85 for a 1-kilo bag – while noodles would cost around $1.20 for the same amount, and rice even only $1. There seemed definitely truth behind the claims that it had become too expensive for the locals. However, it turned out that critics who claimed us greedy first-worlders would eat all the quinoa and leave the farmers without their most nutritional food were actually wrong. While quinoa had been grown in the Andes for over 6,000 years and been a main staple for the people who lived in the altiplano for centuries(since corn doesn’t grow at 4,000 meters/13,100 feet), its cultivation had been prohibited by the Spanish when they conquered the region and replaced it with European foods such as wheat and rye. The ‘mother grain’, as it is called by the Incas, never made a comeback after the Spanish left – particularly potatoes and corn had replaced quinoa. That’s why many Bolivians outside of the altiplano don’t even know quinoa (!) and it hasn’t been on their menu for decades. Some of the older generations still cook it occasionally, but people here prefer potatoes, corn and rice. Quinoa had become so insignificant for Bolivia’s agricultural sector that it was only grown by very few farmers in the altiplano. It was only thanks to the sudden demand from North America and Europe that production was boosted again. Instead of stealing the locals’ food, the demand for quinoa from overseas enabled the farmers to buy better agricultural equipment, have a significantly higher income and to afford better food. The people who were eating quinoa all along still keep a share of the harvest for their own consumption – after all, only the very best quality quinoa is exported. That’s something we experienced in South America: whenever we did find quinoa in the local markets, its quality was way below the quality we were used to from the States. When we did find quinoa on restaurant menus, they were usually special vegetarian restaurants. Local restaurants almost never offered any quinoa dishes. Since quinoa had become so popular, it has started to improve living conditions in Bolivia’s altiplano, one of the poorest regions of the country. More demand called for more quinoa fields, it employed more people, and the higher income helps them to build better houses and achieve a better quality of life. They did use to eat more quinoa before it became a food phenomenon in the first-world, but only because they didn’t have much of an alternative. 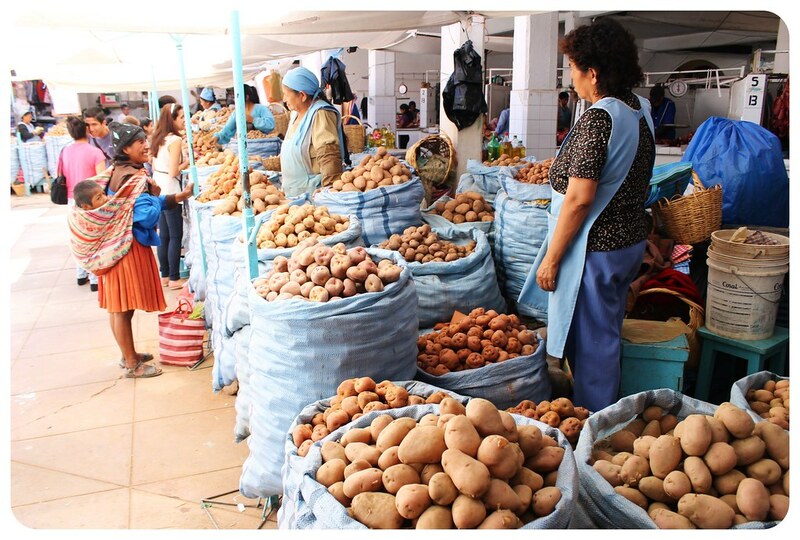 Now, thanks to their larger income, they are also able to afford more foods that can’t be grown in the altiplano. The country’s president actually pushes its production and offered huge loans to quinoa farmers in the last few years. Do you love quinoa as much as we do? Feel free to share your favorite quinoa recipe in the comments below! And if you’ve traveled through the Andes, we’d love to hear if you felt quinoa was nowhere to be found or if you came across it more than we did! 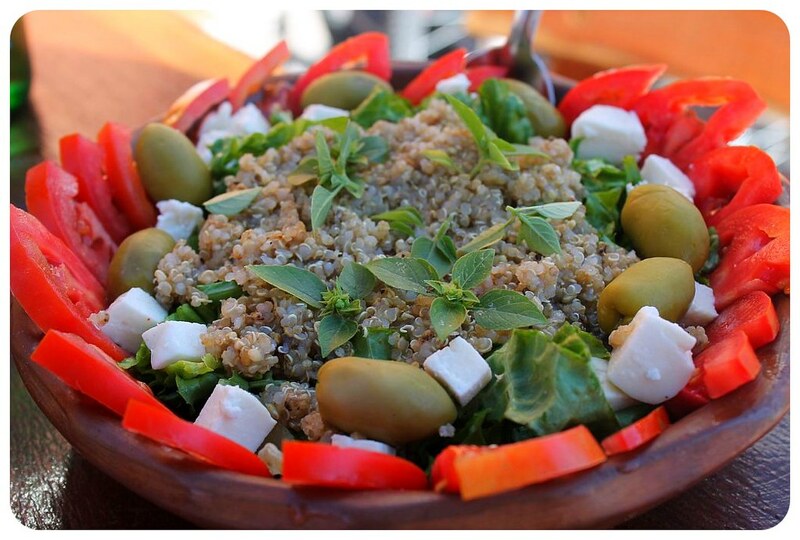 We love Quinoa and have really missed it since we began traveling in Mexico and Central America seven months ago. We found it on occasion at specialty or health food stores but it is was far more expensive than back in the US or Canada. Then one day we were shopping at Mega in Puerto Vallarta and we struck up a conversation with an American expat who introduced us to Amaranth which is very similar to Quinoa. It was available at Mega in bulk and was really inexpensive. Sadly since we left Puerto Vallarta we have not had any luck finding it again, even in the Mega stores in Playa Del Carmen where we are now living.. In a medium bowl, whisk together red wine vinegar, sugar, garlic, red pepper flakes, and a dash of salt and pepper. Add cucumber and scallion and toss to combine. Cover and let stand. In a large bowl, whisk together olive oil and 2 teaspoons lemon juice. Add cooled quinoa, parsley, mint, and lettuce to the bowl and toss to coat. Heat a grill pan or skillet over medium heat (no oil) and grill the halloumi until golden, about two minutes on each side. (Cheese can also be grilled in a panini press.) When done, squeeze a little lemon juice over the cheese. Arrange quinoa salad on two plates and top with the halloumi and cucumbers (without liquid). Can make up to a day ahead and refrigerate. For best texture, add the lettuce and grill the halloumi just before serving. My food think about South America has been the coffee! You think you would be able to get a decent cup of it everywhere, but they mainly drink instant Nescafe! Arlene – there were actually travelers who had quinoa for the first time on the Salt Flats tour 🙂 Our guide also pointed out several quinoa fields when we were off-roading through the South West near the salt flats. And – totally agree on the coffee!! 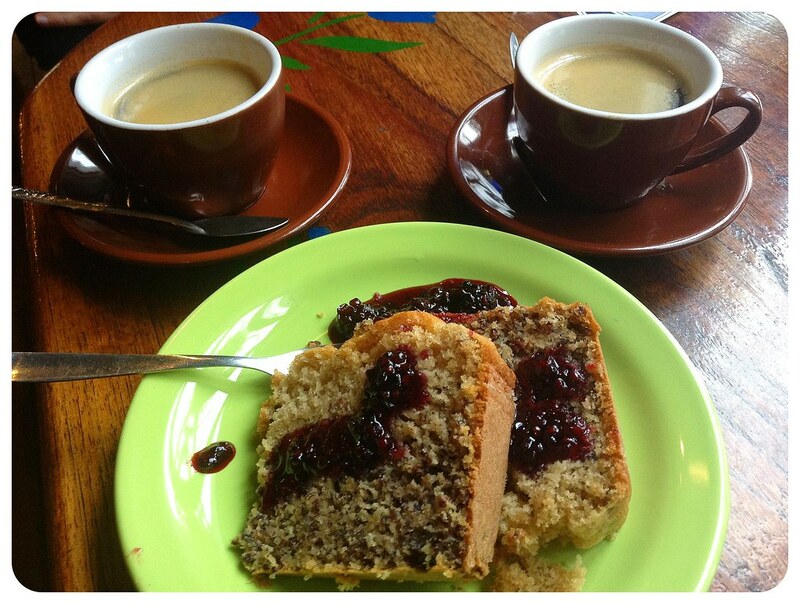 The instant coffee (esp in Chile) drove us nuts! We did find some good coffee shops in the end – but we paid a lot of money for a good cup of coffee! As founder and Director of the BoTierra Biodiversity Research Center in N. California with the mission to search for and trial little-known under-utilized nutritionally dense widely adaptable indigenous food plants that might offer U.S.farmers new crop alternatives, I have been propagating various varieties of quinoa with great success. I have also had visiting Bolivian farmers to our Center who shared the commitment to maintain the indigenous cooperative collective model of production in my community here. Quinoa is a life-saver…especially when you add the fact that the leaves are a delicious nutritious green coming in with 20% protein. I enjoyed your article…but want to point out that potatoes originated in the Andes and were not one of the “European foods” you mentioned that the Spanish replaced. I would also like to commend Andean Naturals Quinoa Company for their 5-Star Faire Trade commitment to the Bolivian family collectives that provide in my opinion the finest quinoa available in the U.S. I also read about the efforts of farmers in the U.S. to grow quinoa and am curious to see how this turns out! I remember reading something about Quinoa and how our consumption of it was hurting the people of South America and ever since then, I feel guilty every time I buy it. I never really researched it (which I probably should have done), but now that you guys have done the research – Thanks for this! It’s good to be mindful of where our food comes from and what impact our consumption of them have on the world in general. P.S. I was in Chicago this past weekend and I absolutely loved it! I have to admit quinoa didn’t “spark” yet, despite me being vegetarian as well, but those pictures and the recipe Erin posted are mouthwatering indeed! P.S. Didn’t know you were a vegetarian, too!! You should know that many years ago, quinoa in Peru and Bolivia was only used to feed chicken , ducks and other farm animals. In fact i remember that 10 years ago , quinoa was very cheap and easy to get. Things change over the years. today is quinoa , tomorrow will be products like The Stevia, the most powerful natural sweetener. Jorge – To feed chickens and farm animals, really?? It’s crazy to think that they got better nutrition than most humans 😉 Stevia is hugely popular at the moment, too, you’re right about that, btw!! I hope it’ll become more popular in South America, too, Amanda! 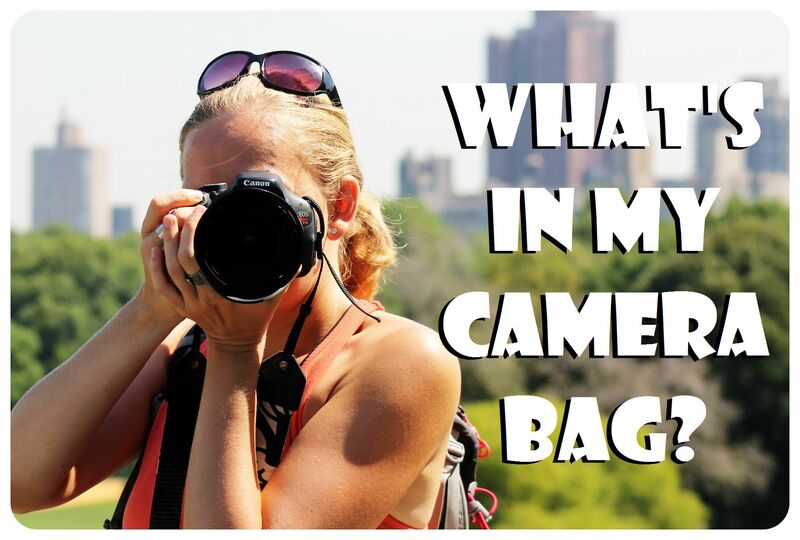 Bringing some with you is a good idea though – we bought a huge bag in a market in Santiago de Chile which we carried with us all the way into Bolivia, and we were happy we had it because we couldn’t find quinoa anywhere else!! I first discovered quinoa in Argentina on a short vacation in 2009 or maybe it was 2010. Interesting to learn more about the impact it has had in Bolivia recently. Stephanie – I still remember an amazing quinoa risotto with Camembert cheese we had in Buenos Aires 🙂 Also the yummy quinoa empanadas in the north of Argentina 🙂 I am happy that Bolivia benefits from the recent quinoa hype in the States – the country needs this boost so much. I am also happy that the president pushes quinoa growing so much! Food for thought – If you know Bolivia and it’s history a little further than you know that yes Quinoa is a staple int he Andean culture. It may not be in the urban culture of Bolivia though. Something to differentiate. Yes Andean culture as it pertains mainly to La Paz- the Aymaras do eat quinuoa but less now because of the cost. Compare this crop to the growth of Cocoa leaves and you will see the farmers and the users of the cocoa leaf have never suffered from affording to use and maintain it’s use in the culture. Why is that? Because the Bolivian government has always subsidized the cocoa leaf farmer and not the Quinoa farmer. They didn’t have the foresight to realize they would hurt their own people by not including in their international contracts subsidizing for their own farmers. So don’t feel bad my fellow Gringos (North Americans), it’s not your fault there is a demand. Moral of the story, there is always more to the story than just what you read in the news. Maribel – thanks for sharing this! Very interesting, and I didn’t know that. I read that Evo Morales is hugely subsidizing quinoa now though, and heard him talk about the importance of quinoa (and exporting it) – I am interested to see how it effects the Bolivian economy in the long run. I’m living in Peru since a couple of months and used to life in Buenos Aires for almost 3 years.. The deal with quinoa in Peru is the following. Quinoa can be bought in the supermarket for the same price as every product in the beans and lentils section and is even cheaper on local markets. The comparison with rice and potatoes, doesn’t really count for locals, as quinoa doesn’t belong to that category of products here in Peru.. The use of quinoa as we Europeans and those from the United States know it is totally different than what it’s originally used for in Peru (not sure about Bolivia) and that’s most likely why you haven’t seen it around. Here in Peru quinoa is used in a warm drink full of proteins that gives you energy thoughout the whole day, named ‘Emoliente’. Emoliente can be bought at the corner of most streets in typical neighborhoods and a big drink just costs 0.80 soles, around USD 0.25. Many Peruvians start their day drinking Emoliente and honestly nobody here will ever think about making a salad wih quinoa, that is a modern use invented by Americans and Europeans. Hi Tess – thanks so much for your input!! I have to say though that I saw quinoa in several supermarkets in Cuzco and was shocked to see how much more expensive than rice / beans it was there!! I remember that in Peru we mainly ate quinoa in soups. Never came across Emoliente but I’ll look out for it when I’m back in Peru!! Are you based in Lima? Wow, so delighted to know that quinoa is creating a better life for quinoa farmers — since I know it’s created a better life for me! YUM. Thanks for the super informative post! Besides Quinoa they have other super foods in Colombia. In Colombia you are able to eat super foods like maca, yucca and plantain.They all contain high amount of plant-based proteins and a very healthy for us.